Resources are the additional files and static content that your code uses, such as bitmaps, layout definitions, user interface strings, animation instructions, and more. You should always externalize app resources such as images and strings from your code, so that you can maintain them independently. You should also provide alternative resources for specific device configurations, by grouping them in specially-named resource directories. At runtime, Android uses the appropriate resource based on the current configuration. For example, you might want to provide a different UI layout depending on the screen size or different strings depending on the language setting. Once you externalize your app resources, you can access them using resource IDs that are generated in your project's R class. This document shows you how to group your resources in your Android project and provide alternative resources for specific device configurations, and then access them from your app code or other XML files. As you can see in this example, the res/ directory contains all the resources (in subdirectories): an image resource, two layout resources, mipmap/ directories for launcher icons, and a string resource file. The resource directory names are important and are described in table 1. Note: For more information about using the mipmap folders, see Managing Projects Overview. mipmap/ Drawable files for different launcher icon densities. For more information on managing launcher icons with mipmap/ folders, see Managing Projects Overview. menu/ XML files that define app menus, such as an Options Menu, Context Menu, or Sub Menu. See Menu Resource. However, if you need access to original file names and file hierarchy, you might consider saving some resources in the assets/ directory (instead of res/raw/). Files in assets/ aren't given a resource ID, so you can read them only using AssetManager. font/ Font files with extensions such as .ttf, .otf, or .ttc, or XML files that include a <font-family> element. For more information about fonts as resources, go to Fonts in XML. Caution: Never save resource files directly inside the res/ directory—it causes a compiler error. The resources that you save in the subdirectories defined in table 1 are your "default" resources. That is, these resources define the default design and content for your app. However, different types of Android-powered devices might call for different types of resources. For example, if a device has a larger than normal screen, then you should provide different layout resources that take advantage of the extra screen space. Or, if a device has a different language setting, then you should provide different string resources that translate the text in your user interface. To provide these different resources for different device configurations, you need to provide alternative resources, in addition to your default resources. Almost every app should provide alternative resources to support specific device configurations. For instance, you should include alternative drawable resources for different screen densities and alternative string resources for different languages. At runtime, Android detects the current device configuration and loads the appropriate resources for your app. You can also use the MCC alone (for example, to include country-specific legal resources in your app). If you need to specify based on the language only, then use the language and region qualifier instead (discussed next). 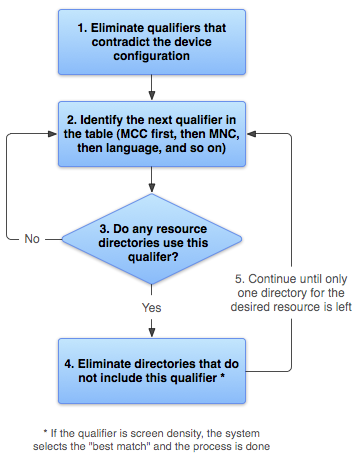 If you decide to use the MCC and MNC qualifier, you should do so with care and test that it works as expected. The language is defined by a two-letter ISO 639-1 language code, optionally followed by a two letter ISO 3166-1-alpha-2 region code (preceded by lowercase r). Android 7.0 (API level 24) introduced support for BCP 47 language tags, which you can use to qualify language- and region-specific resources. A language tag is composed from a sequence of one or more subtags, each of which refines or narrows the range of language identified by the overall tag. For more information about language tags, see Tags for Identifying Languages. To use a BCP 47 language tag, concatenate b+ and a two-letter ISO 639-1 language code, optionally followed by additional subtags separated by +. The language tag can change during the life of your app if the users change their language in the system settings. See Handling Runtime Changes for information about how this can affect your app during runtime. See Localization for a complete guide to localizing your app for other languages. Also see the getLocales() method, which provides the defined list of locales. This list includes the primary locale. The layout direction of your app. ldrtl means "layout-direction-right-to-left". ldltr means "layout-direction-left-to-right" and is the default implicit value. This can apply to any resource such as layouts, drawables, or values. Note: To enable right-to-left layout features for your app, you must set supportsRtl to "true" and set targetSdkVersion to 17 or higher. The fundamental size of a screen, as indicated by the shortest dimension of the available screen area. Specifically, the device's smallestWidth is the shortest of the screen's available height and width (you may also think of it as the "smallest possible width" for the screen). You can use this qualifier to ensure that, regardless of the screen's current orientation, your app's has at least <N> dps of width available for its UI. For example, if your layout requires that its smallest dimension of screen area be at least 600 dp at all times, then you can use this qualifier to create the layout resources, res/layout-sw600dp/. The system uses these resources only when the smallest dimension of available screen is at least 600dp, regardless of whether the 600dp side is the user-perceived height or width. The smallest width is a fixed screen size characteristic of the device; the device's smallest width doesn't change when the screen's orientation changes. Using smallest width to determine the general screen size is useful because width is often the driving factor in designing a layout. A UI will often scroll vertically, but have fairly hard constraints on the minimum space it needs horizontally. The available width is also the key factor in determining whether to use a one-pane layout for handsets or multi-pane layout for tablets. Thus, you likely care most about what the smallest possible width will be on each device. The smallest width of a device takes into account screen decorations and system UI. For example, if the device has some persistent UI elements on the screen that account for space along the axis of the smallest width, the system declares the smallest width to be smaller than the actual screen size, because those are screen pixels not available for your UI. When your app provides multiple resource directories with different values for the smallestWidth qualifier, the system uses the one closest to (without exceeding) the device's smallestWidth. Also see the android:requiresSmallestWidthDp attribute, which declares the minimum smallestWidth with which your app is compatible, and the smallestScreenWidthDp configuration field, which holds the device's smallestWidth value. Specifies a minimum available screen width, in dp units at which the resource should be used—defined by the <N> value. This configuration value changes when the orientation changes between landscape and portrait to match the current actual width. When your app provides multiple resource directories with different values for this configuration, the system uses the one closest to (without exceeding) the device's current screen width. The value here takes into account screen decorations, so if the device has some persistent UI elements on the left or right edge of the display, it uses a value for the width that is smaller than the real screen size, accounting for these UI elements and reducing the app's available space. Specifies a minimum available screen height, in "dp" units at which the resource should be used—defined by the <N> value. This configuration value changes when the orientation changes between landscape and portrait to match the current actual height. When your app provides multiple resource directories with different values for this configuration, the system uses the one closest to (without exceeding) the device's current screen height. The value here takes into account screen decorations, so if the device has some persistent UI elements on the top or bottom edge of the display, it uses a value for the height that is smaller than the real screen size, accounting for these UI elements and reducing the app's available space. Screen decorations that aren't fixed (such as a phone status bar that can be hidden when full screen) are not accounted for here, nor are window decorations like the title bar or action bar, so apps must be prepared to deal with a somewhat smaller space than they specify. small: Screens that are of similar size to a low-density QVGA screen. The minimum layout size for a small screen is approximately 320x426 dp units. Examples are QVGA low-density and VGA high density. normal: Screens that are of similar size to a medium-density HVGA screen. The minimum layout size for a normal screen is approximately 320x470 dp units. Examples of such screens a WQVGA low-density, HVGA medium-density, WVGA high-density. large: Screens that are of similar size to a medium-density VGA screen. The minimum layout size for a large screen is approximately 480x640 dp units. Examples are VGA and WVGA medium-density screens. xlarge: Screens that are considerably larger than the traditional medium-density HVGA screen. The minimum layout size for an xlarge screen is approximately 720x960 dp units. In most cases, devices with extra-large screens would be too large to carry in a pocket and would most likely be tablet-style devices. Added in API level 9. Caution: If all your resources use a size qualifier that is larger than the current screen, the system will not use them and your app will crash at runtime (for example, if all layout resources are tagged with the xlarge qualifier, but the device is a normal-size screen). This is based purely on the aspect ratio of the screen (a "long" screen is wider). This isn't related to the screen orientation. Added in API level 23. Also see the isScreenRound() configuration method, which indicates whether the screen is round. Added in API level 26. Also see the isScreenWideColorGamut() configuration method, which indicates whether the screen has a wide color gamut. Also see the isScreenHdr() configuration method, which indicates whether the screen has a HDR capabilities. This can change during the life of your app if the user rotates the screen. See Handling Runtime Changes for information about how this affects your app during runtime. Added in API level 8, television added in API 13, watch added in API 20. For information about how your app can respond when the device is inserted into or removed from a dock, read Determining and Monitoring the Docking State and Type. This can change during the life of your app if the user places the device in a dock. You can enable or disable some of these modes using UiModeManager. See Handling Runtime Changes for information about how this affects your app during runtime. This can change during the life of your app if night mode is left in auto mode (default), in which case the mode changes based on the time of day. You can enable or disable this mode using UiModeManager. See Handling Runtime Changes for information about how this affects your app during runtime. nodpi: This can be used for bitmap resources that you don't want to be scaled to match the device density. nnndpi: Used to represent non-standard densities, where nnn is a positive integer screen density. This shouldn't be used in most cases. Use standard density buckets, which greatly reduces the overhead of supporting the various device screen densities on the market. There is a 3:4:6:8:12:16 scaling ratio between the six primary densities (ignoring the tvdpi density). So, a 9x9 bitmap in ldpi is 12x12 in mdpi, 18x18 in hdpi, 24x24 in xhdpi and so on. Note: Using a density qualifier doesn't imply that the resources are only for screens of that density. If you don't provide alternative resources with qualifiers that better match the current device configuration, the system may use whichever resources are the best match. notouch: Device doesn't have a touchscreen. keysexposed: Device has a keyboard available. If the device has a software keyboard enabled (which is likely), this may be used even when the hardware keyboard isn't exposed to the user, even if the device has no hardware keyboard. If no software keyboard is provided or it's disabled, then this is only used when a hardware keyboard is exposed. This can change during the life of your app if the user opens a hardware keyboard. See Handling Runtime Changes for information about how this affects your app during runtime. Also see the configuration fields hardKeyboardHidden and keyboardHidden, which indicate the visibility of a hardware keyboard and the visibility of any kind of keyboard (including software), respectively. navhidden: Navigation keys aren't available (such as behind a closed lid). This can change during the life of your app if the user reveals the navigation keys. See Handling Runtime Changes for information about how this affects your app during runtime. Note: Some configuration qualifiers have been added since Android 1.0, so not all versions of Android support all the qualifiers. Using a new qualifier implicitly adds the platform version qualifier so that older devices are sure to ignore it. For example, using a w600dp qualifier automatically includes the v13 qualifier, because the available-width qualifier was new in API level 13. To avoid any issues, always include a set of default resources (a set of resources with no qualifiers). For more information, see the section about Providing the Best Device Compatibility with Resources. You can specify multiple qualifiers for a single set of resources, separated by dashes. For example, drawable-en-rUS-land applies to US-English devices in landscape orientation. Alternative resource directories cannot be nested. For example, you cannot have res/drawable/drawable-en/. Values are case-insensitive. The resource compiler converts directory names to lower case before processing to avoid problems on case-insensitive file systems. Any capitalization in the names is only to benefit readability. Only one value for each qualifier type is supported. For example, if you want to use the same drawable files for Spain and France, you cannot have a directory named drawable-rES-rFR/. Instead you need two resource directories, such as drawable-rES/ and drawable-rFR/, which contain the appropriate files. However, you aren't required to actually duplicate the same files in both locations. Instead, you can create an alias to a resource. See Creating alias resources below. After you save alternative resources into directories named with these qualifiers, Android automatically applies the resources in your app based on the current device configuration. Each time a resource is requested, Android checks for alternative resource directories that contain the requested resource file, then finds the best-matching resource (discussed below). If there are no alternative resources that match a particular device configuration, then Android uses the corresponding default resources (the set of resources for a particular resource type that doesn't include a configuration qualifier). When you have a resource that you'd like to use for more than one device configuration (but don't want to provide as a default resource), you don't need to put the same resource in more than one alternative resource directory. Instead, you can (in some cases) create an alternative resource that acts as an alias for a resource saved in your default resource directory. Note: Not all resources offer a mechanism by which you can create an alias to another resource. In particular, animation, menu, raw, and other unspecified resources in the xml/ directory don't offer this feature. If you save this file as drawables.xml (in an alternative resource directory, such as res/values-en-rCA/), it is compiled into a resource that you can reference as R.drawable.icon, but is actually an alias for the R.drawable.icon_ca resource (which is saved in res/drawable/). If you save this file as main.xml, it is compiled into a resource you can reference as R.layout.main, but is actually an alias for the R.layout.main_ltr resource. The R.string.hi resource is now an alias for the R.string.hello. Once you provide a resource in your application, you can apply it by referencing its resource ID. All resource IDs are defined in your project's R class, which the aapt tool automatically generates. When your application is compiled, aapt generates the R class, which contains resource IDs for all the resources in your res/ directory. For each type of resource, there is an R subclass (for example, R.drawable for all drawable resources), and for each resource of that type, there is a static integer (for example, R.drawable.icon). This integer is the resource ID that you can use to retrieve your resource. The resource type: Each resource is grouped into a "type," such as string, drawable, and layout. For more about the different types, see Resource Types. The resource name, which is either: the filename, excluding the extension; or the value in the XML android:name attribute, if the resource is a simple value (such as a string). string is the resource type and hello is the resource name. There are many Android APIs that can access your resources when you provide a resource ID in this format. See Accessing Resources in Code. string is the resource type and hello is the resource name. You can use this syntax in an XML resource any place where a value is expected that you provide in a resource. See Accessing Resources from XML. You can also retrieve individual resources using methods in Resources, which you can get an instance of with getResources(). <package_name> is the name of the package in which the resource is located (not required when referencing resources from your own package). <resource_type> is the R subclass for the resource type. <resource_name> is either the resource filename without the extension or the android:name attribute value in the XML element (for simple values). See Resource Types for more information about each resource type and how to reference them. There are many methods that accept a resource ID parameter and you can retrieve resources using methods in Resources. You can get an instance of Resources with Context.getResources(). Caution: You should never modify the R.java file by hand—it is generated by the aapt tool when your project is compiled. Any changes are overridden next time you compile. Note: You should use string resources at all times, so that your application can be localized for other languages. For information about creating alternative resources (such as localized strings), see Providing alternative resources. For a complete guide to localizing your application for other languages, see Localization. This sounds redundant, but can be very useful when using alternative resource. Read more about Creating alias resources. A style attribute resource allows you to reference the value of an attribute in the currently-applied theme. Referencing a style attribute allows you to customize the look of UI elements by styling them to match standard variations supplied by the current theme, instead of supplying a hard-coded value. Referencing a style attribute essentially says, "use the style that is defined by this attribute, in the current theme." Here, the android:textColor attribute specifies the name of a style attribute in the current theme. Android now uses the value applied to the android:textColorSecondary style attribute as the value for android:textColor in this widget. Because the system resource tool knows that an attribute resource is expected in this context, you do not need to explicitly state the type (which would be ?android:attr/textColorSecondary)—you can exclude the attr type. While uncommon, you might need access your original files and directories. If you do, then saving your files in res/ won't work for you, because the only way to read a resource from res/ is with the resource ID. Instead, you can save your resources in the assets/ directory. Files saved in the assets/ directory are not given a resource ID, so you can't reference them through the R class or from XML resources. Instead, you can query files in the assets/ directory like a normal file system and read raw data using AssetManager. However, if all you require is the ability to read raw data (such as a video or audio file), then save the file in the res/raw/ directory and read a stream of bytes using openRawResource(). In this example, simple_list_item_1 is a layout resource defined by the platform for items in a ListView. You can use this instead of creating your own layout for list items. In order for your app to support multiple device configurations, it's very important that you always provide default resources for each type of resource that your app uses. For example, if your app supports several languages, always include a values/ directory (in which your strings are saved) without a language and region qualifier. If you instead put all your string files in directories that have a language and region qualifier, then your app will crash when run on a device set to a language that your strings don't support. But, as long as you provide default values/ resources, then your app will run properly (even if the user doesn't understand that language—it's better than crashing). Likewise, if you provide different layout resources based on the screen orientation, you should pick one orientation as your default. For example, instead of providing layout resources in layout-land/ for landscape and layout-port/ for portrait, leave one as the default, such as layout/ for landscape and layout-port/ for portrait. Providing default resources is important not only because your app might run on a configuration you hadn't anticipated, but also because new versions of Android sometimes add configuration qualifiers that older versions don't support. If you use a new resource qualifier, but maintain code compatibility with older versions of Android, then when an older version of Android runs your app, it will crash if you don't provide default resources, because it cannot use the resources named with the new qualifier. For example, if your minSdkVersion is set to 4, and you qualify all of your drawable resources using night mode (night or notnight, which were added in API Level 8), then an API level 4 device cannot access your drawable resources and will crash. In this case, you probably want notnight to be your default resources, so you should exclude that qualifier so your drawable resources are in either drawable/ or drawable-night/. So, in order to provide the best device compatibility, always provide default resources for the resources your app needs to perform properly. Then create alternative resources for specific device configurations using the configuration qualifiers. There is one exception to this rule: If your app's minSdkVersion is 4 or greater, you don't need default drawable resources when you provide alternative drawable resources with the screen density qualifier. Even without default drawable resources, Android can find the best match among the alternative screen densities and scale the bitmaps as necessary. However, for the best experience on all types of devices, you should provide alternative drawables for all three types of density. By comparing the device configuration to the available alternative resources, Android selects drawables from drawable-en-port. Figure 2. Flowchart of how Android finds the best-matching resource. Eliminate resource files that contradict the device configuration. The drawable-fr-rCA/ directory is eliminated, because it contradicts the en-GB locale. Exception: Screen pixel density is the one qualifier that is not eliminated due to a contradiction. Even though the screen density of the device is hdpi, drawable-port-ldpi/ isn't eliminated because every screen density is considered to be a match at this point. More information is available in the Supporting Multiple Screens document. Do any of the resource directories include this qualifier? Exception: If the qualifier in question is screen pixel density, Android selects the option that most closely matches the device screen density. In general, Android prefers scaling down a larger original image to scaling up a smaller original image. See Supporting Multiple Screens. The remaining directory is drawable-en-port. Though this procedure is executed for each resource requested, the system further optimizes some aspects. One such optimization is that once the device configuration is known, it might eliminate alternative resources that can never match. For example, if the configuration language is English ("en"), then any resource directory that has a language qualifier set to something other than English is never included in the pool of resources checked (though a resource directory without the language qualifier is still included). When selecting resources based on the screen size qualifiers, the system uses resources designed for a screen smaller than the current screen if there are no resources that better match (for example, a large-size screen uses normal-size screen resources if necessary). However, if the only available resources are larger than the current screen, the system doesn't use them and your app will crash if no other resources match the device configuration (for example, if all layout resources are tagged with the xlarge qualifier, but the device is a normal-size screen). Note: The precedence of the qualifier (in table 2) is more important than the number of qualifiers that exactly match the device. For example, in step 4 above, the last choice on the list includes three qualifiers that exactly match the device (orientation, touchscreen type, and input method), while drawable-en has only one parameter that matches (language). However, language has a higher precedence than these other qualifiers, so drawable-port-notouch-12key is out.